Even though I have a lot of love for the classic monster movies, in my adult life they’re the ones I certainly haven’t re-visited enough. Gareth Edwards’ Godzilla  remains a recent favourite of the big budget ones because it gave the creature a huge look, a valid fight and some unexpectedly poignant attachments. Shin Godzilla was released a year ago in Japan to huge success and, believe it or not, is the 29th film produced by Toho but over 62-years of history doesn’t mean they can’t give it a fresh new look, and try something different. 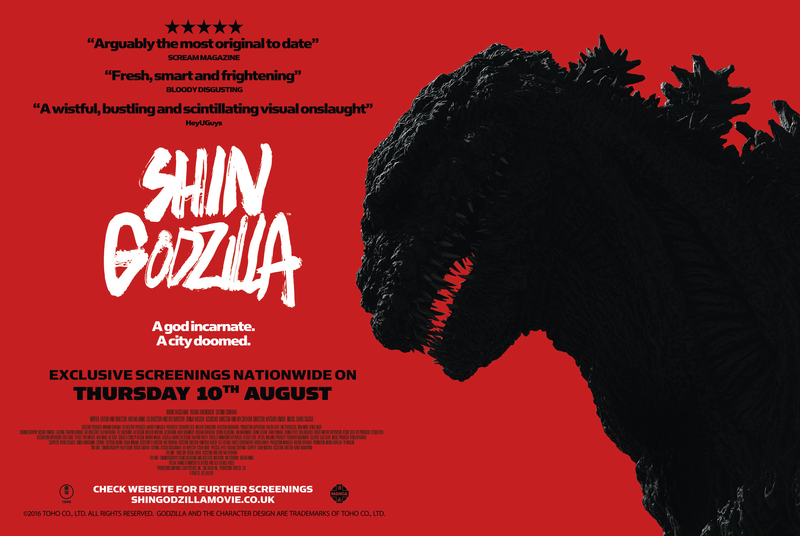 Co-directed by Evangelion’s Hideaki Anno and Shinji Higuchi (director of the Attack on Titan live action movies), Shin Godzilla is an attack on the senses from the moment it starts, in a positive sense, and also sees the progression of the great monster from a bumbling youngster, right through to a literally huge beast that’s the ultimate powerhouse. The film stars Hiroki Hasegawa and Satomi Ishihara, who were also in the live-action Attack on Titan films, as well as Yutaka Takenouchi and Mikako Ichikawa who all fit within a huge cast. Scored with real purpose by Shiro Sagisu, his music lends itself well to the visually very ambitious setup because shots give us an obvious sense of scale as the Japanese prove that if you want to make it big, then get hundreds of extras and abundant Godzilla demolition. I was somewhat in awe of Godzilla’s use of nuclear energy to defend himself, it all looks wonderful and becomes both awe-inspiring and entertaining. While the directors may mix up small sets and real-life, they have a lot of fun with what they’ve got and try to keep the scenes interesting, a good example is even early on when you’re basically watching five different meetings but they fly by and decisions get made. For the casual viewer, you’re in a barrage of information as events take place and gather speed incredibly quickly with these elements especially true in the first hour. 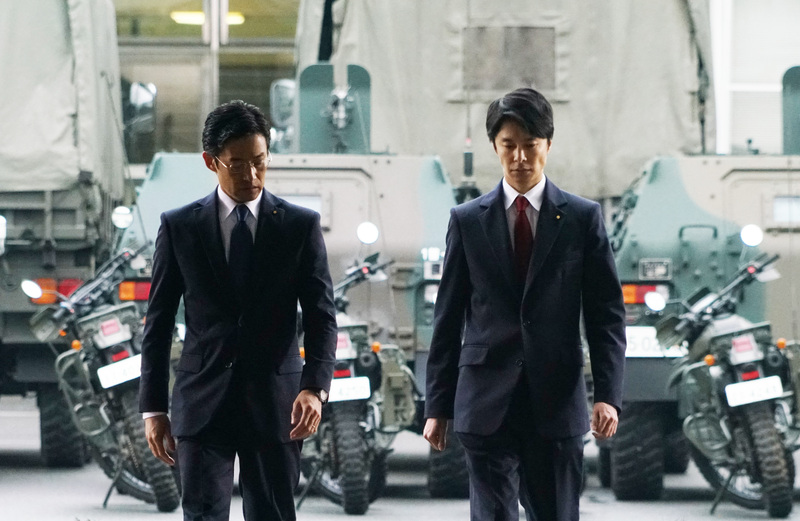 But Shin Godzilla isn’t just about the monster because it is, of course, a comment on the woes of bureaucracy in democracy. There’s also a clear indication of the pros and cons of following specific legislation but, on the other hand, a balanced narrative that also points out how well it works when done properly and especially working ‘together’ across the globe. While some of that might sound a little dull, it’s surprisingly different because although they don’t skip over any process, it’s done so quickly it’s oddly compelling. If you want to know how to get facts across, and do it with massively to-the-point precision, then Shin Godzilla is a prime example of intense, distinctive effectiveness where not a single moment of discussion, or progression, is wasted. While they could have easily lost about 20-25 minutes of undue over-planning, it still didn’t take anything away from an enjoyable, unique experience and only fuelled my desire for more Godzilla, the true King of the Monsters, in the future. Tags: Gareth Edwards, Godzilla, Gojira, Hideaki Anno, Hiroki Hasegawa, Mikako Ichikawa, Satomi Ishihara, Shin Godzilla, Shinji Higuchi, Shiro Sagisu, Yutaka Takenouchi. Bookmark the permalink.